Global prices have converged, likely on the expectation of a trade deal with China. But the arbitrages that developed back when U.S. beans were selling at a discount are in some ways more interesting. The United States’ number one or two export to China (depending a bit on the market price, and a bit on how many airplanes China is buying). The leading, and most politically significant, casualty of the trade war. And something that I have followed for a long time. My mother grew up on a ‘beans and corn (and horses and sheep) farm. The massive seasonal impact of the U.S. harvest on total U.S. exports to China has always jumped out at me—both because of Midwestern pride (we impact the global data!) 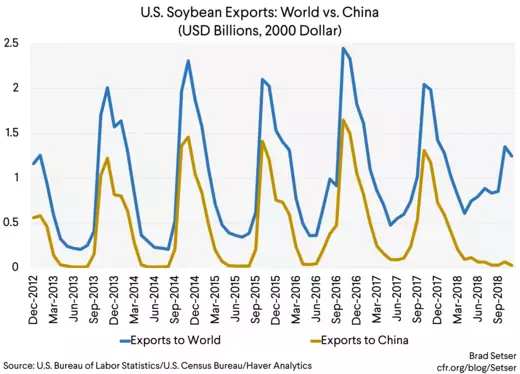 and because its persistence always seemed to me to be a reflection of a much bigger story (the weakness of U.S. non-agricultural exports generally, but especially to China). And well, now the entire world finds soybeans interesting. I thought various arbitrage conditions associated with trade in a true commodity would limit the impact of China’s tariff on U.S. prices. I got that wrong. The initial impact of the tariff was quite clearly a fall in U.S. prices relative to Brazilian prices. China, which accounts for something like two-thirds of world ‘bean import demand, was so big that it had market power (its tariffs lowered U.S. prices more than it raised Chinese prices). That gap between Brazilian and American beans has now closed (the U.S. government’s agricultural trade data is really good). But it isn’t clear why. The return of (modest) Chinese purchases? The market’s growing ability to arbitrage around the tariffs over time? Or a recognition that Brazil’s bumper exports have severely depleted Brazil’s soybean stocks? 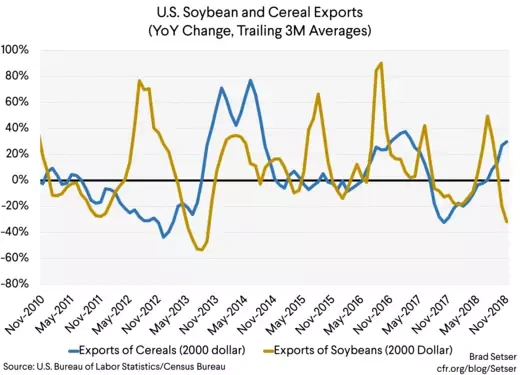 Here is what I think we know from the trade data about the ways the global market adjusted to China’s soybean tariff. One: China has both shifted its imports toward Brazil, and reduced its total imports. 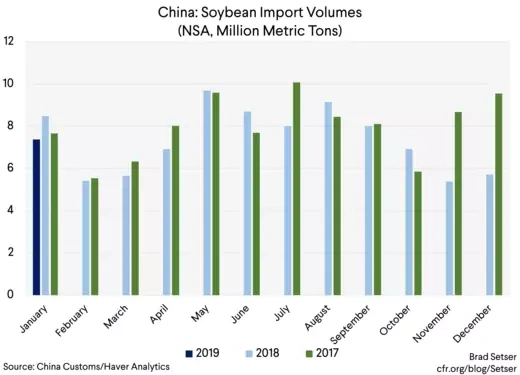 There usually is a bit of a bump in China’s imports both after the Southern Hemisphere harvest and the Northern Hemisphere harvest. This year the second bump didn’t happen. The U.S. is exporting more to other destinations, but not enough to make up for the loss of the Chinese market (China is about two-thirds of global import demand, and about two-thirds of U.S. exports). Soy export volumes are down. Four. The gap between U.S. and Brazilian soy prices did open up a lot of interesting arbitrages. 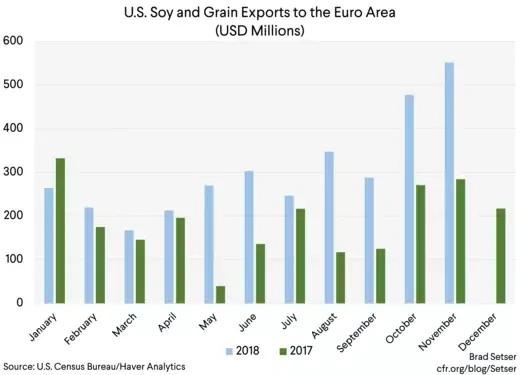 Europe is importing a lot more U.S. soy—and soy substitutes with the rapeseed Europe produces in the animal feed market. But to be honest, that’s the boring, predictable arbitrage. It goes back to the origins of the soybean trade (the substitution of US ‘beans for European grains in the market for livestock feed). As the FT reported, the United States for a while was exporting a lot of soy to Iran (I assume to feed Iranian chickens, not Iranian pigs). Egypt is acting like a good ally, and buying US beans at discount. 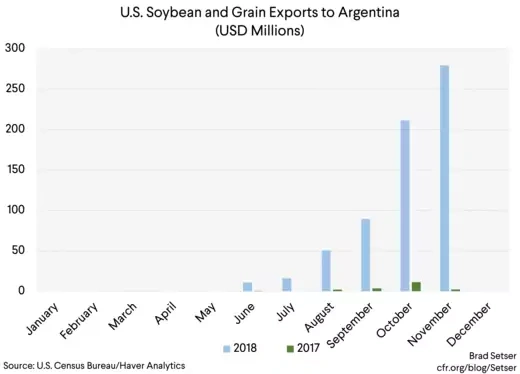 And now the United States is exporting a decent amount of soy beans to Argentina. Argentina’s own harvest was weak. But not so weak that Argentina, a major soy exporter, actually needs to import beans. The soy exported to Argentina is likely crushed and then re-exported as soymeal…as Argentina has a lot of crushing capacity. Markets do tend to respond to obvious arbitrage opportunities, like those created by the U.S. soy discount earlier this year. 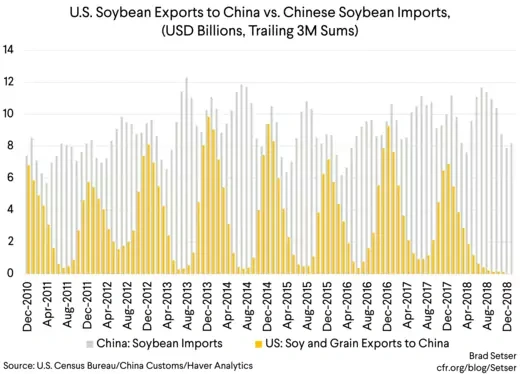 So my guess—and it is only a guess—is that the U.S. soy discount was too big to last for all that much longer even if China hadn’t resumed some soy purchases. Of course, any discount hurts U.S. farmers. The trade war has drawn attention to the difficulties many farmers now face. But in a lot of ways, the trouble in the agricultural sector predates Trump’s trade war. What matters most to farmers is the price they get for their harvest, and the really big fall in agricultural prices came back in 2014. And that is tied, in a way, to the dollar. The dollar’s strength has encouraged Brazilian exports—and contributed to a growing revival in Russia’s agricultural exports. 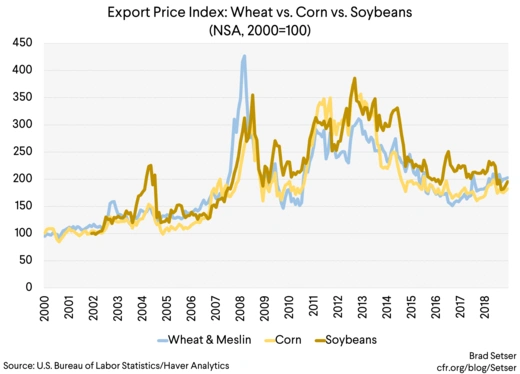 And to maintain the competitiveness of the U.S. crop relative to other big grain exporters, the dollar price of the main U.S. export crops had to fall. Farmers who took out big loans during the period of high agricultural prices (which happens to coincide with the period when the dollar was relatively weak) are now hurting. There is no doubt that the impact of Trump’s trade war on U.S. farmers deserves all the attention it now gets. But I do wish that the impact of the dollar’s rise back in 2014 and 2015 on a host of U.S. sectors (agriculture, manufacturing) had gotten similar attention. Most economists, would, I think say that the value of the dollar has a bigger impact than trade policy on the trade balance and—absent a massive trade war—on the volume of overall U.S. exports. * I was expecting a big drop in agricultural exports in q4 that would weigh on q4 GDP, but it just isn’t in the BEA data on “feed and food export volumes” for q4, thanks to corn.